This tutorial will show you how to perform discriminant analysis with Praat. As an example, we will use the dataset from Pols et al. (1973) with the frequencies and levels of the first three formants from the 12 Dutch monophthongal vowels as spoken in /h_t/ context by 50 male speakers. This data set has been incorporated into Praat and can be called into play with the Create TableOfReal (Pols 1973)... command that can be found in the "New / TableOfReal" menu. In the list of objects a new TableOfReal object will appear with 6 columns and 600 rows (50 speakers × 12 vowels). The first three columns contain the formant frequencies in Hz, the last three columns contain the levels of the first three formants given in decibels below the overall sound pressure level of the measured vowel segment. Each row is labelled with a vowel label. table = Create TableOfReal (Pols 1973): "yes"
# change the column labels too, for nice plot labels. 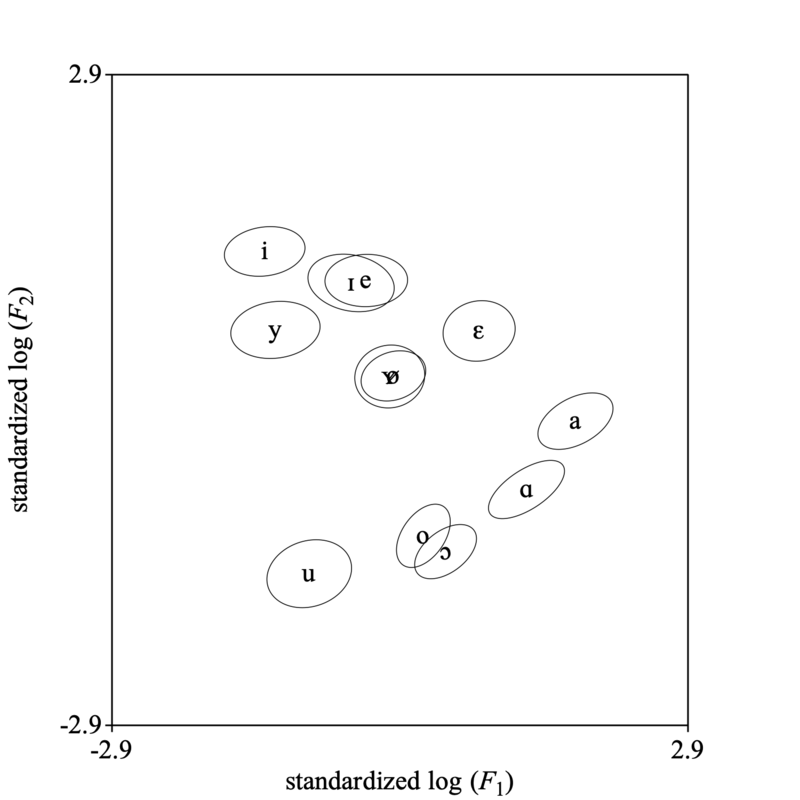 Set column label (index): 1, "standardized log (%F__1_)"
Set column label (index): 2, "standardized log (%F__2_)"
Set column label (index): 3, "standardized log (%F__3_)"
Set column label (index): 4, "standardized %L__1_"
Set column label (index): 5, "standardized %L__2_"
Set column label (index): 6, "standardized %L__3_"
To get an indication of what these data look like, we make a scatter plot of the first standardized log-formant-frequency against the second standardized log-formant-frequency. With the next script fragment you can reproduce the following picture. 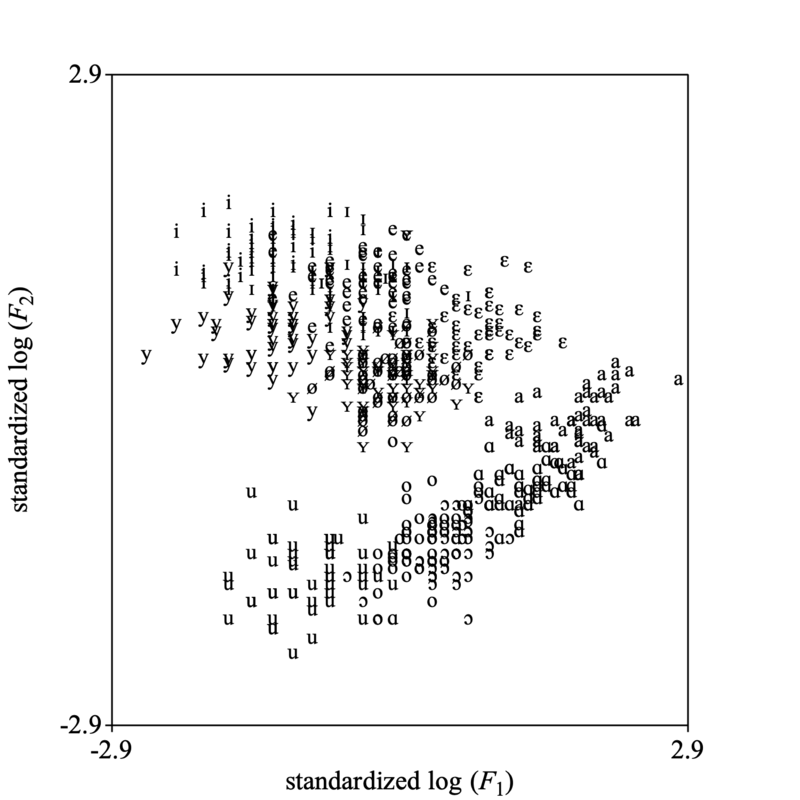 Draw scatter plot: 1, 2, 0, 0, -2.9, 2.9, -2.9, 2.9, 10, "yes", "+", "yes"
Apart from a difference in scale this plot is the same as fig. 3 in the Pols et al. article. You select a TableOfReal and a Discriminant object together and choose: To Configuration.... One of the options of the newly created Configuration object is to draw it. The following picture shows how the data look in the plane spanned by the first two dimensions of this Configuration. 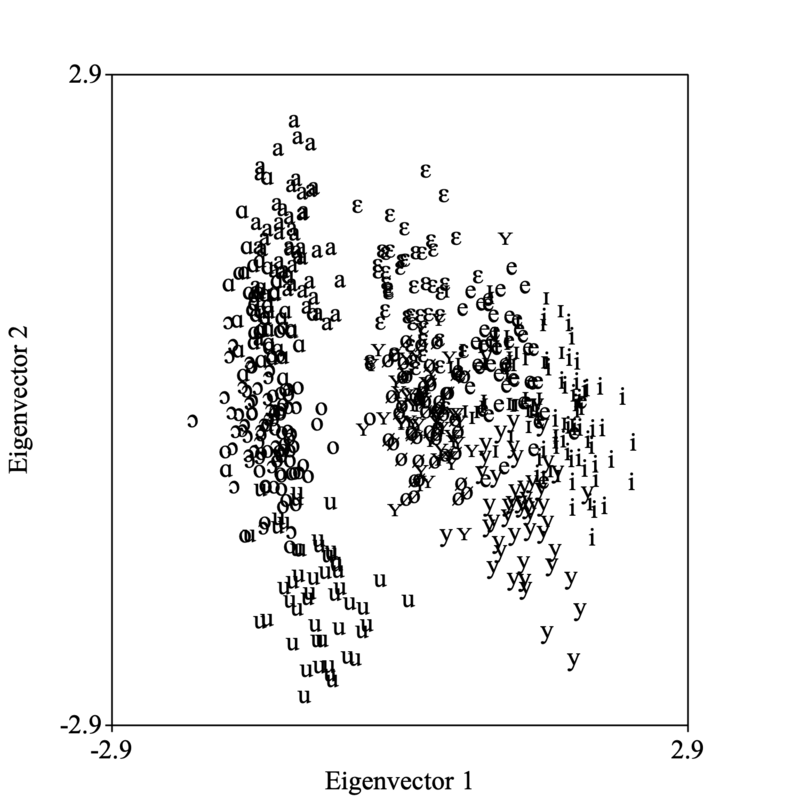 The directions in this configuration are the eigenvectors from the Discriminant. Draw: 1, 2, -2.9, 2.9, -2.9, 2.9, 12, "yes", "+", "yes"
Draw sigma ellipses: 1.0, "no", 1, 2, -2.9, 2.9, -2.9, 2.9, 12, "yes"
Select together the Discriminant object (the classifier), and a TableOfReal object (the data to be classified). Next you choose To ClassificationTable. Normally you will enable the option Pool covariance matrices and the pooled covariance matrix will be used for classification. The ClassificationTable can be converted to a Confusion object and its fraction correct can be queried with: Confusion: Get fraction correct. In general you would separate your data into two independent sets, TRAIN and TEST. You would use TRAIN to train the discriminant classifier and TEST to test how well it classifies. Several possibilities for splitting a dataset into two sets exist. We mention the jackknife ("leave-one-out") and the bootstrap methods ("resampling"). classification = To ClassificationTable: "yes", "yes"
confusion = To Confusion: "yes"
appendInfoLine: fractionCorrect, " (= fraction correct, jackknifed ", numberOfRows, " times)." The following script summarizes bootstrap classification. appendInfoLine: fractionCorrect, " (= fraction correct, bootstrapped ", numberOfBootstraps, " times)." What was new in 3.9?